Kusama spent much of her time between 1962 and 1964 sewing thousands of stuffed fabric tubers and grafting them to furniture and found objects to create her Accumulation sculptures. She exhibited the works together in an attempt to create hallucinatory scenes of phallic surfaces but found the labor involved in making them physically and mentally taxing. In response to the labor intensity of this work, she started to utilize mirrors to achieve similar repetition. Infinity Mirror Room— Phalli’ s Field was perhaps the most important breakthrough for Kusama during this immensely fruitful period. The reflective surfaces allowed her vision to transcend the physical limitations of her own productivity. Furthermore, the mirrors created a participatory experience by casting the visitor as the subject of the work, a feature that the artist demonstrated through a provocative series of self-portraits in which she used her body to activate the space. This work first appeared in the exhibition Floor Show, held at Castellane Gallery, in New York, in 1965. 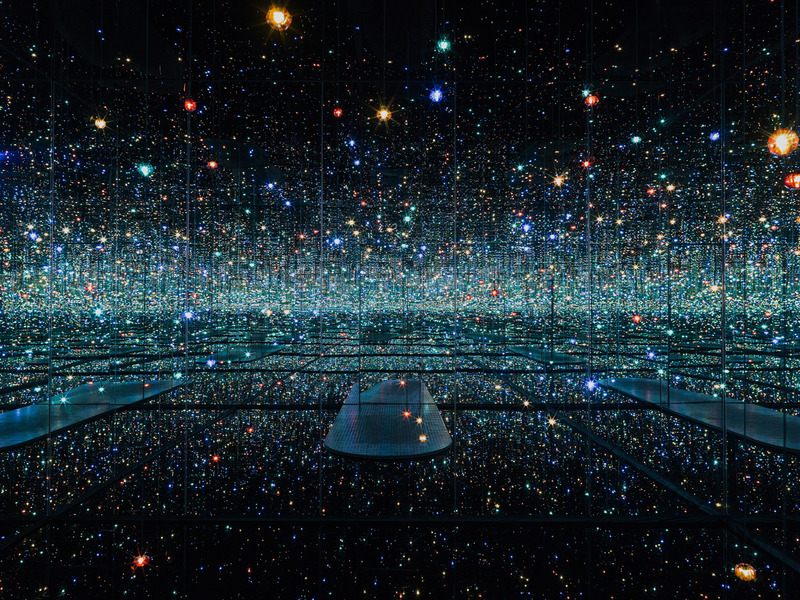 Infinity Mirrored Room—Love Forever is an iteration of the second mirrored environment Kusama created. Sculptural, architectural, and performative, the installation blurs the lines between artistic disciplines and is activated by audience participation. Hexagonal in shape and mirrored on all sides, Love Forever features two peepholes that invite visitors to peer in and see both themselves and another participant repeated into infinity. At the time Kusama created this Infinity Mirror Room, she was experimenting with new technology and viewed the work as a “machine for animation.” During the 1966 exhibition opening of Kusama’s Peep Show, which featured this work, Kusama distributed buttons with the message “Love Forever” printed on them. For the artist, the concept of “Love Forever” stood for civil rights, sexual liberation, the antiwar movement, and the activist groups of the 1960s. Infinity Mirrored Room—The Souls of Millions of Light Years Away is an immersive environment that fosters an out-of-body experience, heightens one’s senses, and produces a repetitive illusion through the use of lights and mirrors. Similar in appearance to stars in the galaxy, hundreds of LED lights hang and flicker in a rhythmic pattern that seems to suspend both space and time. The visitor becomes integral to this work as his or her body activates the environment while simultaneously vanishing into the infinite space. The ethereal nature of the installation can be traced back to the early 2000s, when Kusama began making dimly lit mirrored rooms, a departure from her earlier brightly colored and polka-dotted spaces. Continuing her exploration of the transience of life and the inevitability of death, this installation creates a harmonious and quiet place for visitors to contemplate their existence, reflect on the passage of time, and think about their relationship to the outer world. In 1996, Kusama began creating a series of installations incorporating polka-dotted balloons. Hanging from the ceiling and occupying the floor, these inflatable objects disrupt the viewer’s path. Visitors can enter a mirrored room inside one of the balloons or peer inside another. The work engages visitors on contrasting scales: the tiny micro-space seen through a peephole and the macro life-sized space that envelops the viewer within the installation. A video monitor hanging from the ceiling of the gallery features Kusama singing one of her poems. In Infinity Mirrored Room—Aftermath of Obliteration of Eternity, golden lanterns flicker, creating a shimmering pattern of light that contrasts with the seemingly endless void of the mirrored black space. 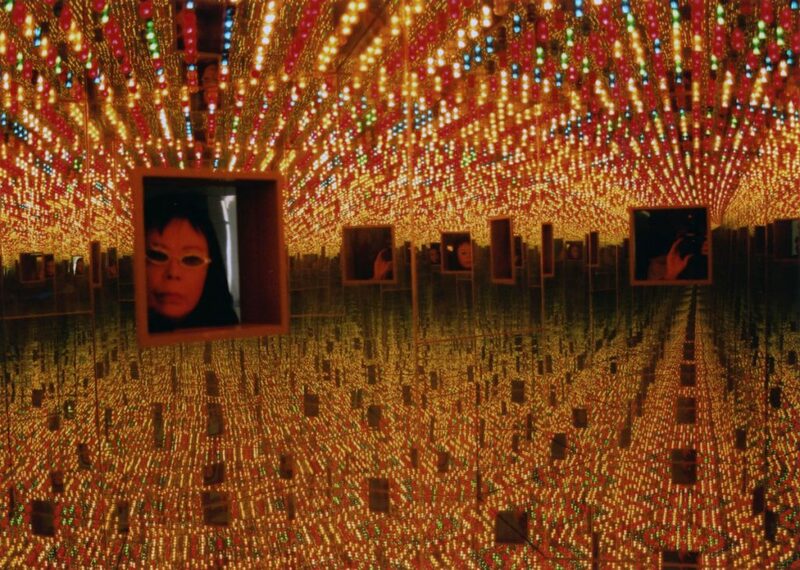 For Kusama, obliteration is a reflection on the experience of death and the potential of the afterlife. The imagery in this work recalls the Japanese tradition of toro nagashi, a ceremony in which paper lanterns known as chochin float down a river to guide ancestral spirits back to their resting places on the final night of the summer obon festivals. The ceremony often commemorates the victims of the atomic bombs. 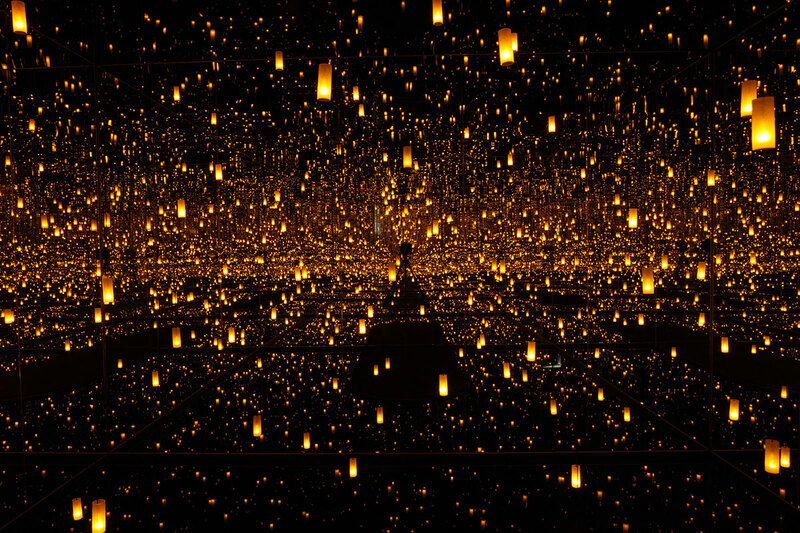 Mesmerizing and intimate, Kusama’s poetic installation underscores the impermanence of life and the certitude of death. Coming from a family that cultivated and sold plant seeds for a living, Kusama saw a pumpkin for the first time during a childhood visit to a seed-harvesting farm with her grandfather. Nestled into the landscape between fields of zinnia, periwinkle, and nasturtium flowers, she spotted an unusually shaped gourd the size of a man’s head. The artist was attracted to the pumpkin for its “charming and winsome form,” celebrating its lumpy, unpretentious, organic shape. The pumpkin motif first appeared in some of Kusama’s drawings from the late 1940s and has repeatedly shown up in her paintings, sculptures, drawings, and installations. 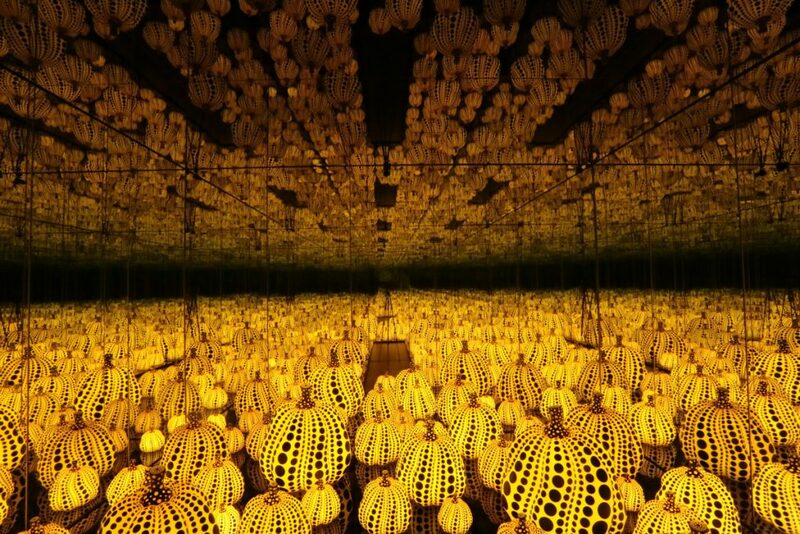 Her initial pumpkin mirrored room was staged in 1991 and was later displayed at the 1993 Venice Biennale. Stepping into Infinity Mirrored Room—All the Eternal Love I Have for the Pumpkins, one is transported to a space that recalls fairytales and fantasy. The glowing pumpkins, modeled after the Japanese kabocha squash, are married with Kusama’s signature polka dot pattern within an infinitely repeating space. 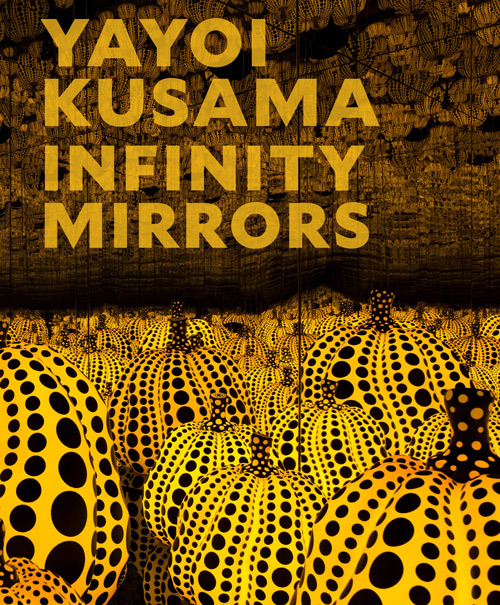 The first publication to focus on Yayoi Kusama’s Infinity Mirror Rooms, this richly illustrated volume includes insightful essays by Mika Yoshitake, Alexander Dumbadze, and Gloria Sutton, as well as an interview with the artist by Melissa Chiu, the Hirshhorn’s director.